Join Team Tobisch for this 2-day workshop. Make tiny 3" finished Shoo Fly & Double Four-Patch blocks while learning to work with the Acorn Precision Piecing System. Join Team Tobisch for this 2-day workshop. Make a Muskrat Paw block while learning about new tools & techniques for cutting, piecing and pressing that effortlessly lead to precision and pin-less piecing! If you need relationship counselling with your machine, then this class is for you. Join Bernie Tobisch in this one-day workshop. Unravel the mystery of tension, learn light maintenance, understand the importance of the right foot. Get closer to your machine and spend more time focused on your sewing, less time frustrated! 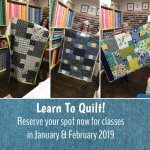 Join Krista Hennebury in this one-day workshop 'VARIEGATED THREADS', a fun workshop for quilters venturing into improv from a traditional quilting background.